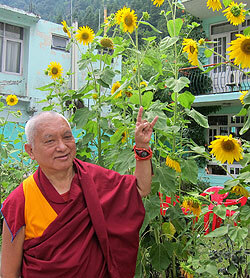 Lama Zopa Rinpoche enjoying the gardens in Manali, India, August 2013. 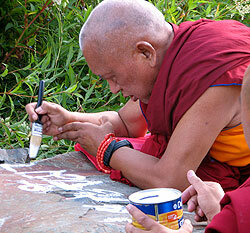 Lama Zopa Rinpoche painting mantras onto rock, India, July 2013. “How many problems there are in the world – global warming, global problems, religion-fighting problems, wow, wow, wow, wow, wow – so many problems. Disease and famine, earthquakes, large numbers of people dying [from these]. Now all that, including global problems, country problems, couple problems, family problems, individual problems: they all come from the mind, not from somewhere else, not from outside. All, everything came from the mind, from the unsubdued mind. “Do not collect any unwholesome action; create wholesome action; subdue one’s own mind. This is the teaching of the Buddha.” Buddha said that. All these problems came from the mind, the unsubdued mind. Liberation, full enlightenment comes from the subdued mind. “Subdue one’s own mind, this is the teaching of the Buddha.” To achieve liberation, the blissful state of peace, liberation from samsara, full enlightenment, to achieve that comes from your mind; it has to come from your mind, by subduing the mind, from the completely subdued mind. Also to immediately stop global problems, country problems, suicidal problems, family problems, your own personal problems, all come from the unsubdued mind. So then by subduing, all the peace and happiness come, as I mentioned before, up to enlightenment – incredible, incredible. So then the Dharma center which offers Buddhadharma, not just a meditation center – there’s all kinds of meditation, like a supermarket – so not that! The Dharma center which offers Buddhism, Buddhist philosophy, and especially the essence, lam-rim, which is particularly focused on subduing the mind, to shape the mind – you need a meditation center like this. Our FPMT centers are like that. These are centers of teaching Buddhism, practicing Buddhism. Their essence is compassion to sentient beings, compassion to every single sentient being – not only your friend but no compassion to the enemy – not like that; compassion to every hell being, hungry ghost, animal, human being, sura, asura, intermediate state beings – compassion. 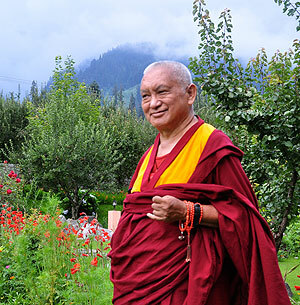 Lama Zopa Rinpoche in Manali, India, July 2013. “Rinpoche is well … It is very important for us to continue doing [the practices Khadro-la advised us to do for Rinpoche’s health and long life] especially at this time when we know there are obstacles for Rinpoche in 2014 and 2015. Khadro-la (Rangjung Neljorma Khadro Namsel Drönme) was very clear for students especially to help by doing as much of the practices as possible. From my heart I would like to express billions, zillions, trillions of thanks, I highly appreciate you doing practices for me. This is also puja for yourself. Even if you don’t think that, it naturally happens like that as it is very powerful karma! I highly appreciate all of you being good human beings practicing the Dharma – not only wanting to achieve temporary happiness in the future but also wanting to be free from the oceans of samsaric suffering and to free all sentient beings from the oceans of suffering and for them to achieve the highest peerless happiness, enlightenment, omniscient mind. This is so important, the utmost need. Generally, to live life for others, to bring happiness to others. Please join us in rejoicing at all the practices done, particularly Amitabha Buddhist Centre, Singapore students who accumulated 1,379,925 mantras of Most Secret Hayagriva for Rinpoche’s good health and long life during a three-day Most Secret Hayagriva puja! We congratulate the first Basic Program graduate of Centre Kalachakra, Ven. Détchèn. Ven. Détchèn passed the final exam and completed her retreat requirement, and received her Basic Program certificate from Centre Kalachakra’s resident geshe, Geshe Drakpa Tsundue. Please rejoice in FPMT’s Charitable Projects which include ambitious initiatives from building 100,000 prayer wheels, stupas, and statues; to providing education scholarships; to granting stipends to all the main teachers and abbots of the Lama Tsongkhapa tradition; to offering over three million nutritious meals to thousands of monks studying at Sera Je Monastery every year; to building hospitals in Tibet and India; to translating Dharma texts into many languages; plus many more. These projects are essential to FPMT’s objective of building a more compassionate world from the inside out and critical to our mission of transmitting Mahayana Buddhist teachings and values worldwide. Every hour of every day, Lama Zopa Rinpoche and FPMT centers, projects, services and students engage in beneficial activities around the world. And every day, you can read their inspiring stories of service and joyful effort by visiting Mandala online. Recent Mandala blog posts include advice from Lama Zopa Rinpoche on “Practicing Bodhichitta Mindfulness in the Kitchen,” an account of Jangtse Chöje’s visit to Vajrapani Institute in California, video of artist Andy Weber at Ganden Tendar Ling in Moscow, and Drolkar McCallum’s reflections on visiting the enthusiastic Lotsawa Rinchen Zangpo Translator Programme 6 students in Dharamsala. Mandala also publishes book reviews – including a review of Wisdom Publications’ recent A Classical Tibetan Reader – and more. Check our blog out today! Give vital support to the FPMT organization. Enrich your Dharma studies. Connect with the global community. Become a Friend of FPMT. Lama Zopa Rinpoche blessing lunch, Manali, India, July 2013. Lama Zopa Rinpoche gave a talk to the volunteers at Amitabha Buddhist Centre, Singapore which is fantastically encouraging to all who offer (or are considering offering) service in the past, present and future at FPMT centers, projects and services. We encourage you to use this advice to thank and inspire your own volunteers. “[The center’s existence] is due to the kindness of all the volunteers, all the directors from the very beginning when we started the center. The center’s present development is the complete result of everyone who served as the directors of the center, all the volunteers, all the people who served at different times: you, everyone, starting from the first director when the center started. So from everybody’s help, the present development comes from that. I want to say thank you very much – billions and zillions and trillions of thanks (I don’t know what comes after that!). So from the heart, really I want to thank everyone. The Masters Program materials web page has been brought one step further toward completion with the addition of the Treasury materials in the FPMT Member’s Area. La traduction en français avance! 4 nouveaux chapitres viennent d’être traduits en français portant ainsi à 13 le nombre de chapitres disponibles (conseils aux centres résidentiels, directives financières, directives éthiques, les enseignants, la sangha, les objets sacrés, etc.). L’équipe de Service de Traduction Francophone continue son travail et d’autres chapitres seront disponibles dans les tous prochains mois. The Great Stupa of Universal Compassion in Australia is looking for a CPMT / retreat coordinator; Nalanda Monastery needs a Basic Program teaching assistant; Tse Chen Ling, USA is looking for a spiritual program coordinator.